In a few select offering of Oakridge® Shingles, there are COOL Roof Collection colors that are specially designed to reflect the sun’s rays, helping to aid in a more energy efficient home. The shingles are designed with solar-reflecting granules to stop the amount of heat that transfers into the home. A home that has the right roofing products also decrease the use of utilities in your home. Owens Corning® ENERGY STAR® qualified shingles when installed correctly can help reduce your energy bills. 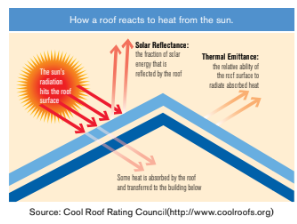 These shingles actually reflect the UV rays which helps decrease the amount of heat that would normally be absorbed into the home which causes your home’s cooling system to run more. Actual savings will vary based on geographic location and individual building characteristics. Call 1-800-GET-PINK® or 1-888-STAR-YES for more information.